Avanti Feeds – A Dream Run! We wrote about Avanti Feeds @Rs.33 and provided couple of updates [1, 2]. 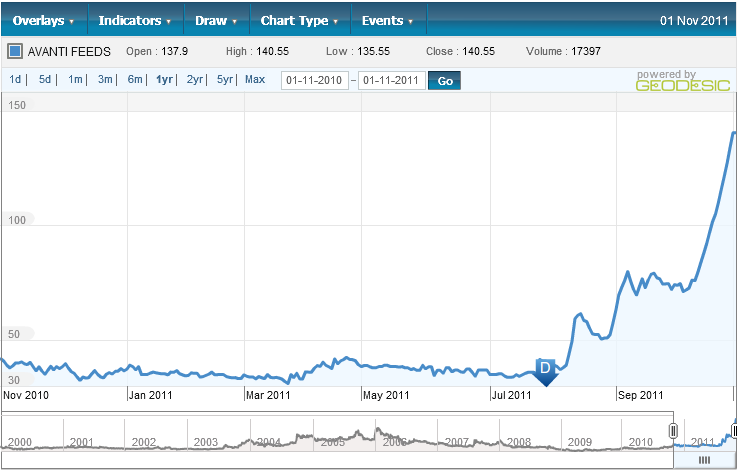 The stock has had a dream run since then and now @Rs.147 it is a 4 bagger in flat 7 months!!! Continue reading Avanti Feeds – A Dream Run! Posted on November 2, 2011 Author ayushCategories UpdateTags Avanti Feeds, multibagger23 Comments on Avanti Feeds – A Dream Run!